What is it to live? 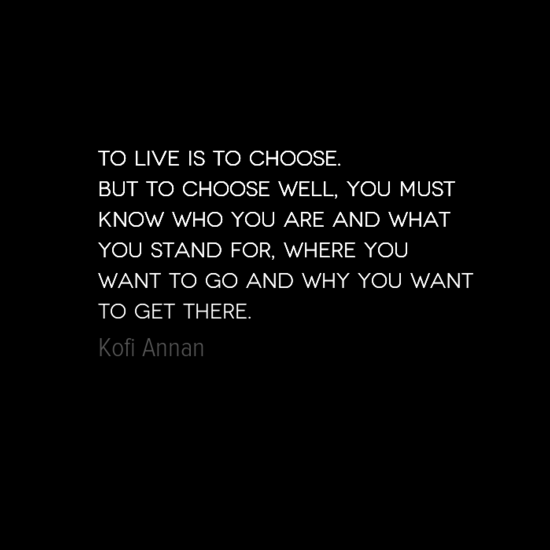 Former UN Secretary General Kofi Annan suggests that to live is to choose. 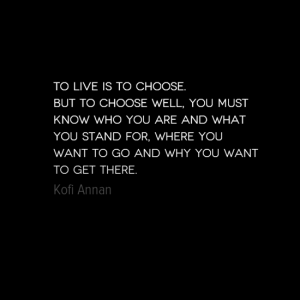 Kofi Annan is a Ghanaian diplomat who served as the 7th Secretary of the United Nations between 1 January 1997 and 31 December 2006. Born in Kumasi, Ghana in 1938 (then part of the Gold Coast) he went on to study Economics at Kumasi College of Science and Technology, now the Kwame Nkrumah University of Science and Technology of Ghana, Following graduation he received a grant to study in the US. In 1962, he started working as a Budget Officer for the World Health Organisation. After brief period working as Director of Tourism in Ghana he returned to the United Nations taking numerous postings before being elected Secretary General in 1996. He was jointly awarded the Nobel Peace Price with the United Nations in 2001.